Music Library patrons have commented many times on the paper flags hanging in the library stacks this Fall, which are part of a relocation project that started in late summer. 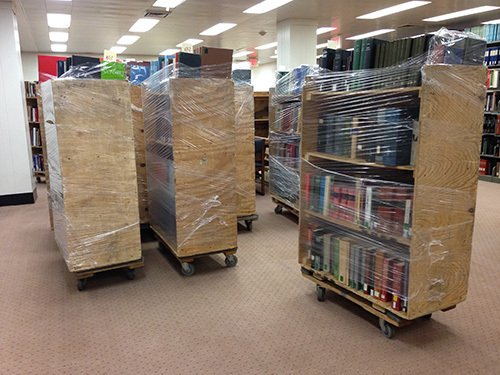 Starting December 14, flagged items will be loaded onto carts and relocated to the Libraries’ Annex facility. All told, around 15,000 titles will make the move and allow for collection growth over the next five to seven years. What happens when something is sent to the Annex? Is it gone forever, or can I still borrow it? You can still borrow it, and quite easily! Books and scores sent to the Annex are available per request through InfoHawk+, much like items held at other campus libraries like Main and Art. 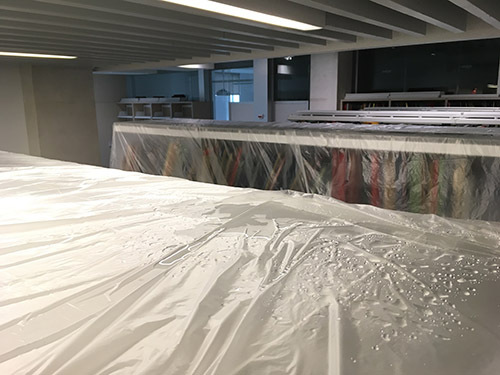 There will be a few months where items will not be available while they are processed and shelved at the Annex facility, but then they are easily requestable online and usually delivered to the library of your choice within 24-48 hours from the time of the request. 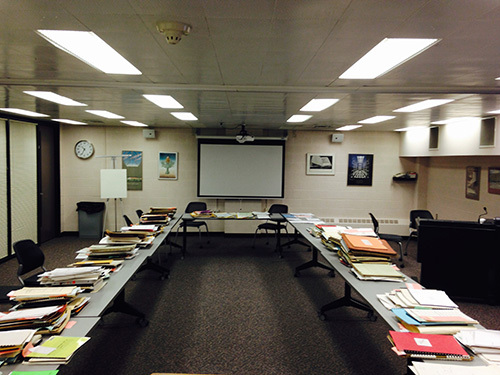 The Music Library did not open in 2016 with much space for collection growth. 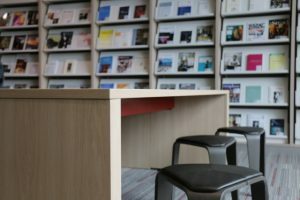 It was estimated that the book collection could grow for 5-7 years, and the score collection for 3-5 years (new libraries usually open with at least a 15-20 year growth factor). 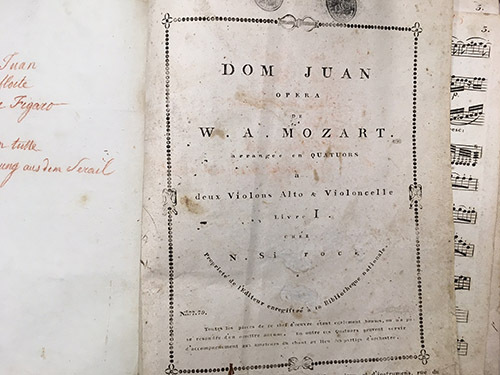 Following this relocation project, the book collection should be able to grow for up to ten years and the score collection for at least five years. 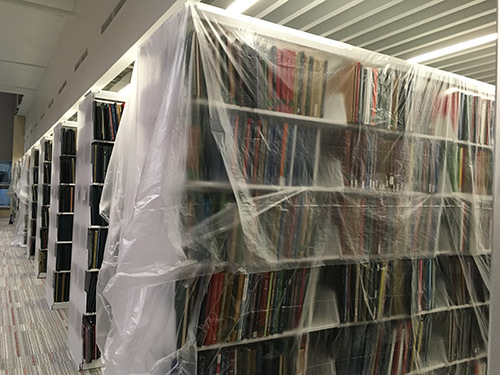 The Annex facility was in the position to take a large shipment of items from the Music Library before the close of the calendar year, so that is why the collection is being evaluated and a portion relocated in 2018. 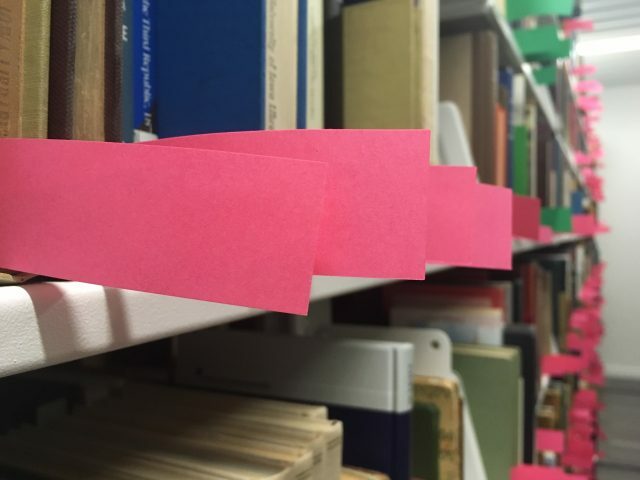 The Libraries elected to evaluate items that were purchased before 2003 and which have not circulated since at least 2003 (or the 15-15 rule). That produced a list of 13,500 books and over 18,000 scores. 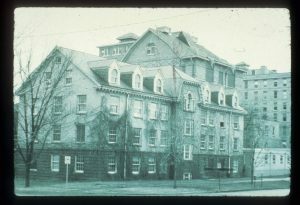 The Library holds over 51,000 books and almost 95,000 scores, which means about 25% of the book collection and 19% of the score collection were evaluated. 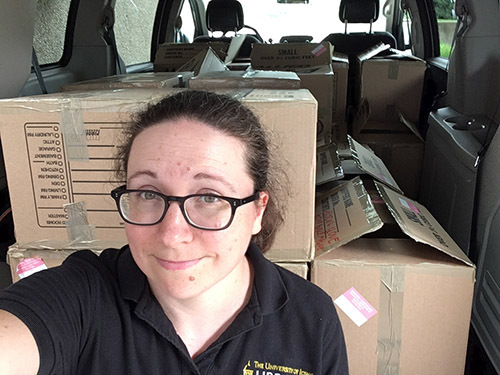 In the end, the Music Library is sending 8,100 books and around 7,000 scores to the Annex, or around 15% of the book collection and 7% of the score collection. 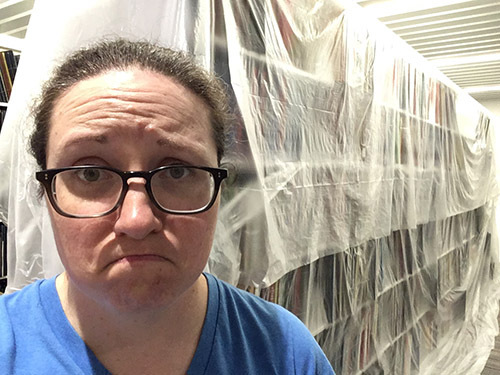 Every single book and score that is being relocated has been physically opened and reviewed by the music librarian. Newer or better editions are available. This was especially true for scores, where many editions from the early 20th century have been superseded by newer editions. 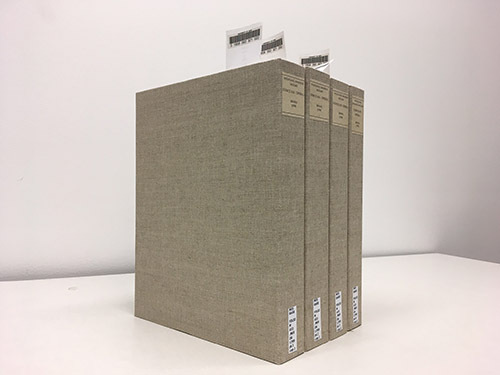 Newer editions also tend to be in better physical condition, so they can withstand the rigors of continued borrowing. Extra copies. Most copy 2s, 3s, etc. have been sent to the Annex. 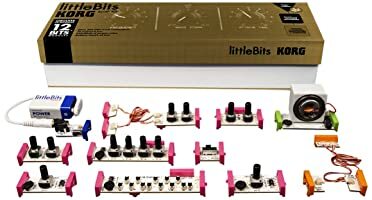 There are exceptions, because some extra copies see a great deal of use (e.g., piano literature). Older foreign language titles. This applied mainly to books, where many older items in German, French, Italian, Spanish, and other European languages were selected to go to storage. There are still many languages and authors from around the world represented across the book collection. However, most items in the collection held here on campus will be in English. Course curricula realignment. This was true for both books AND scores. 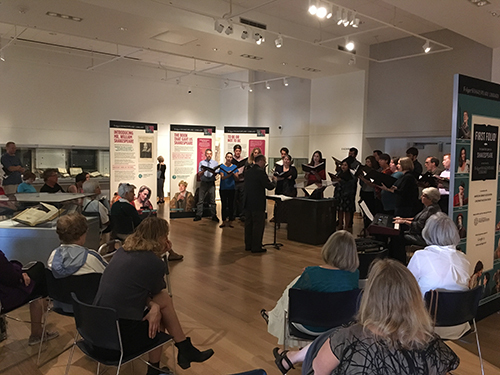 For example, the musicology faculty and courses used to include much more study of medieval and early renaissance music, but now the coursework is more focused on American music and 18th to 21st century repertories. 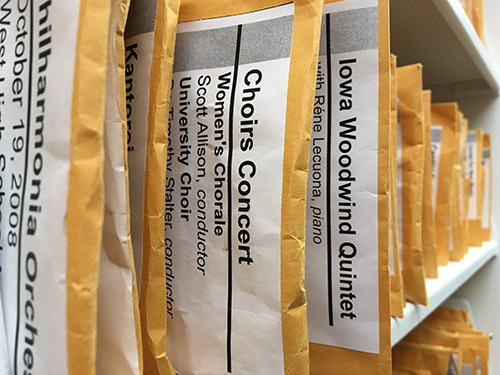 New curricular lines, such as the bachelor’s in Jazz, are areas where the Music Library must develop its collections to support future student and faculty needs. Another good example? The School does not offer degrees in classical guitar and harp, so most solo music in those areas has been sent to storage. Iowa connections. 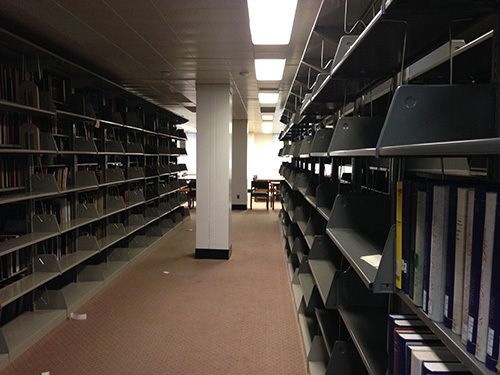 Scores by Iowa composers or alumni, or books written here in Iowa City or by graduates were largely kept in the stacks. Rare or unusual items. 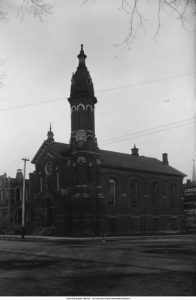 This includes items where the RBML was one of only a few holding libraries or where something about the item was of particular note were kept in the stacks. 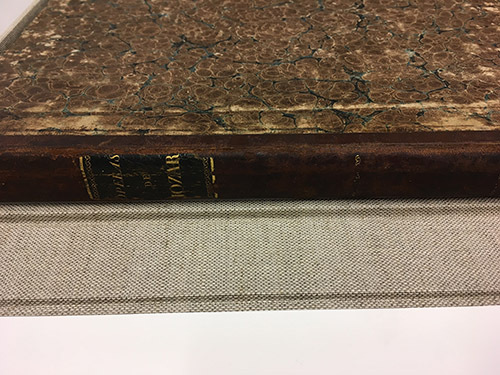 We even found a few items that will move into the Canter Rare Book Room, including a first edition full score of Felix Mendelssohn’s Oedipus in Kolonos, op. 93 from 1852. Maintain balance in the collection. 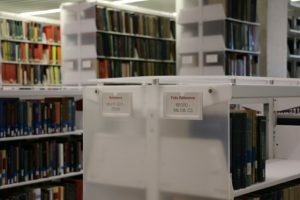 While the collection did need to be reviewed and items relocated, it still needed to be “browsable” so that a student, scholar, or performer could go to the stacks and look through a particular call number and see a reasonable representation of literature on a topic or literature to study and perform. 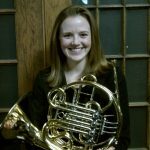 There were times when it was more prudent to keep unused items here on campus because their removal would have eliminated a particular perspective on a topic or thinned the types of composition available for a particular instrument or voice. For example, women composers are already underrepresented in the collection, and removal of their music to storage would only exacerbate the problem. 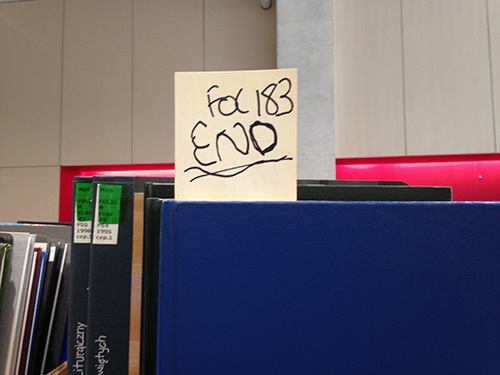 The collection is more balanced when their music is retained in the browsable stacks here on campus. 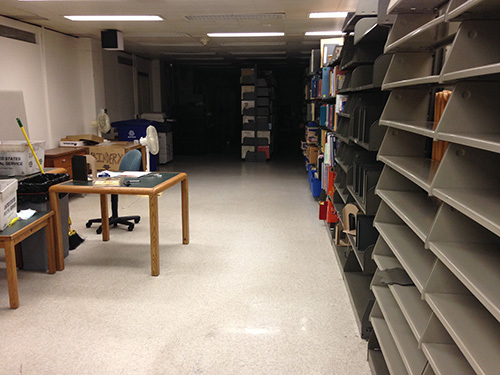 Relocating materials to the Library Annex is not the same as weeding them. Those materials are still available to be checked out, they just must be couriered to campus first. 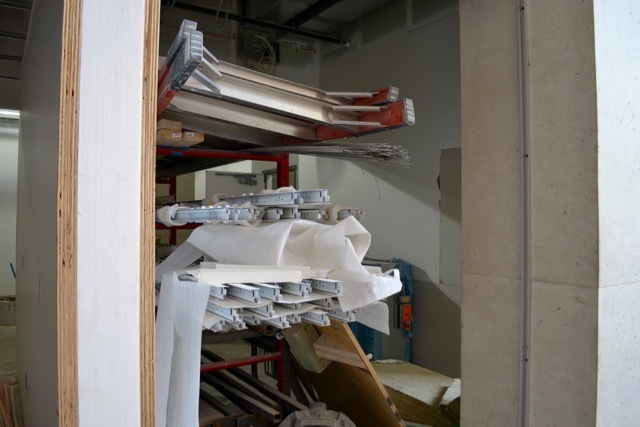 A very small stack of items were weeded from the collection during this process due to damage. This project has helped the Music Library to review the condition, usability, balance, and overall health of its collections. 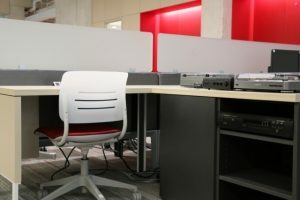 Items can be returned to campus if, indeed, a major mistake has been made or changes to the curriculum require such a move. 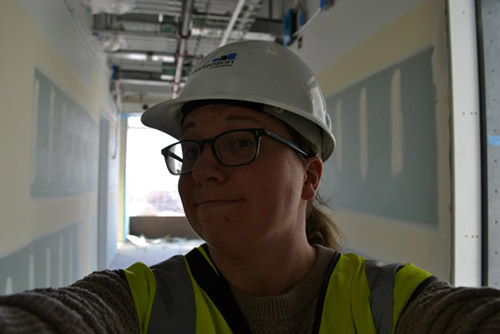 If you have questions about this process or the results, please contact Head of the Rita Benton Music Library, Katie Buehner at katie-buehner@uiowa.edu. 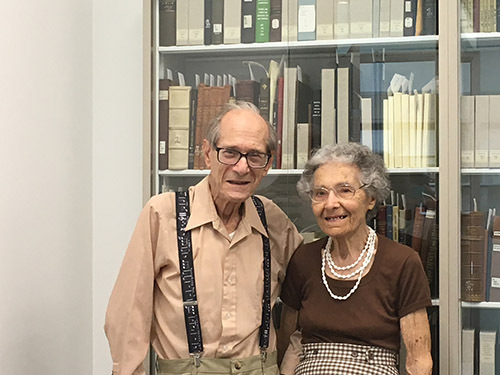 In the summer of 2018, the Rita Benton Music Library “adopted” Wülfie Parsons, who belonged previously to Dr. Donna Parsons. He’s a born and bred Iowa pup, and is settling in nicely to his new home here in Voxman. 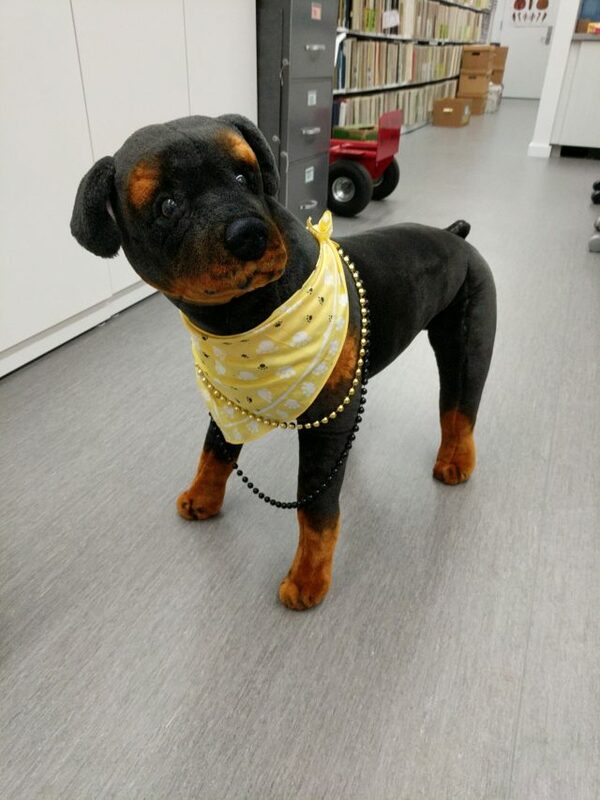 Wülfie will be around the Music Library, usually near the Service Desk, so be sure to stop by and say hello! 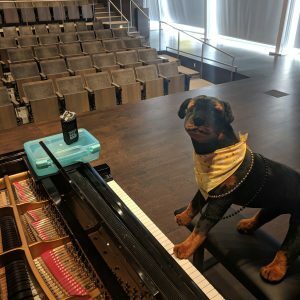 In the meantime, here are Wülfie’s top five things to know about using the Music Library in 2018. 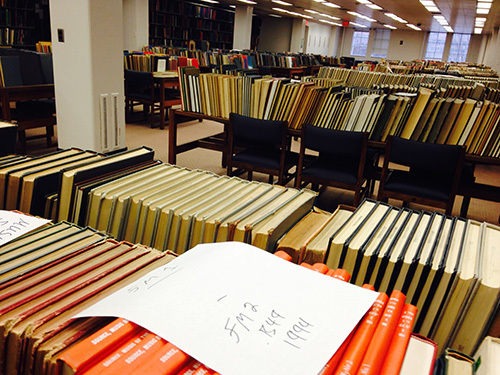 There are over 200,000 items in the library stacks, most of which are scores. Find something that you want to play, hear, or read and use your Iowa One card to borrow it from the Library. 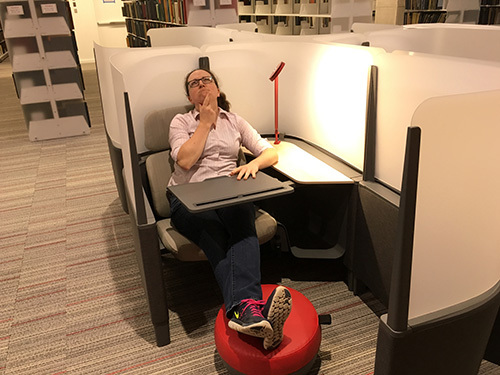 There are large tables, windows, benches, weird 50s looking chair pod things, and Wülfie’s personal favorite seats, the study carrels. 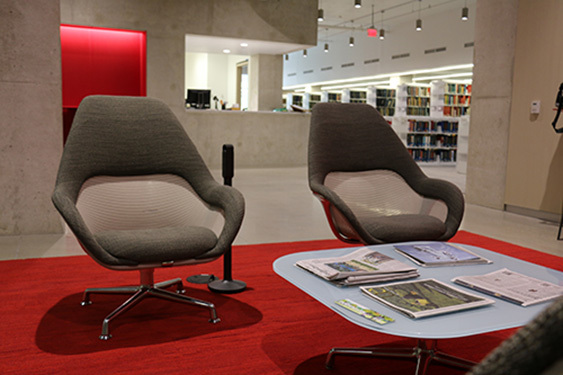 Get comfortable, bring a cup of coffee, and a stack of books or scores, and study in the Music Library. The Music Library has two Zoom H4n digital audio recorders and one Zoom Q8 video recorder available for check out that can be used to record practice sessions, recitals, lessons, or other musical endeavors. Items circulate for one day. 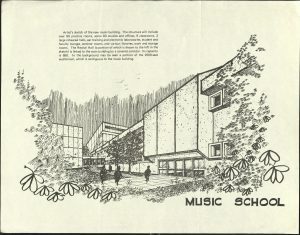 The Library exhibits materials from the School of Music Archives, its vast collections, and much more. 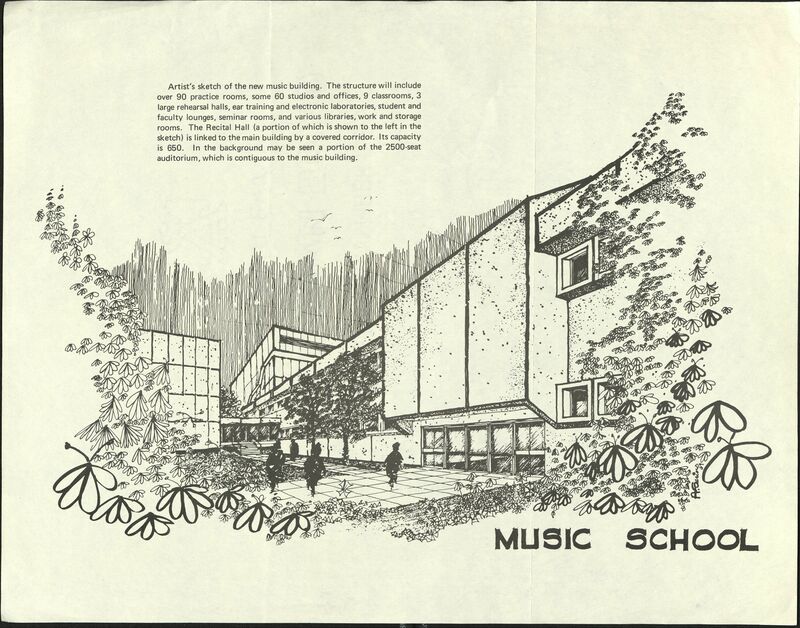 This fall, the Library will mount an exhibit highlighting theses and dissertations by School of Music graduates, including critical editions, compositions, recording projects, and historical research on music in the Midwest, Iowa, and the School of Music. 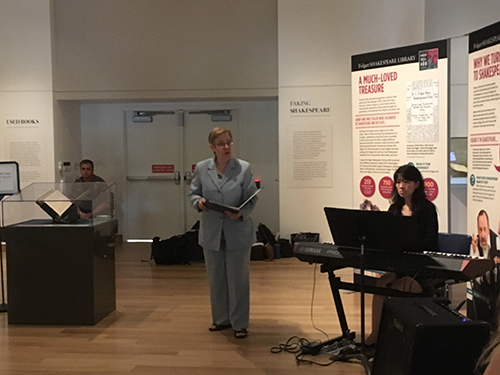 This spring, there will be two exhibits mounted by undergraduate and graduate students enrolled in music classes. 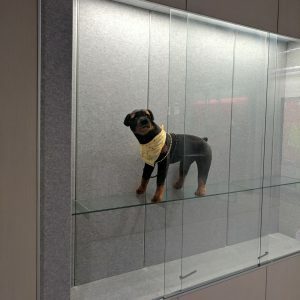 Right now, the case is empty, but Wülfie thought he would make an engaging exhibit item. 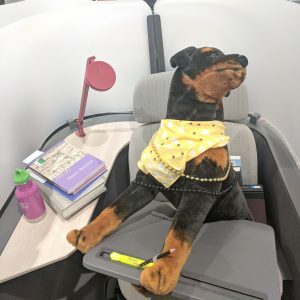 Wülfie thinks the Music Library is a pretty great place to study with friends, and even make new friends. 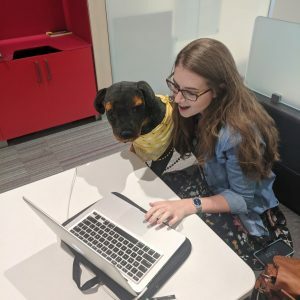 You’ll meet other students in the School and students from other programs, see faculty looking for new music to play or a book for their latest research project, your friendly neighborhood Music Library staff members, and of course, Wülfie! 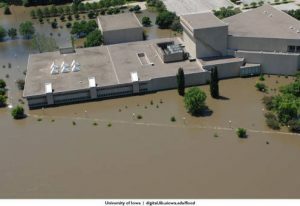 Eight years after the 1,000 year flood, the Rita Benton Music Library has moved from its temporary home on the second floor of the Main Library into the new Voxman Music Building. 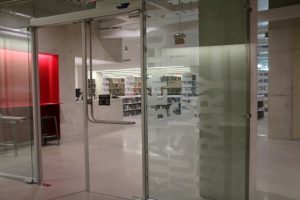 The Library is located on the first floor near the Clinton St. entrance and occupies about 10,000 square feet. 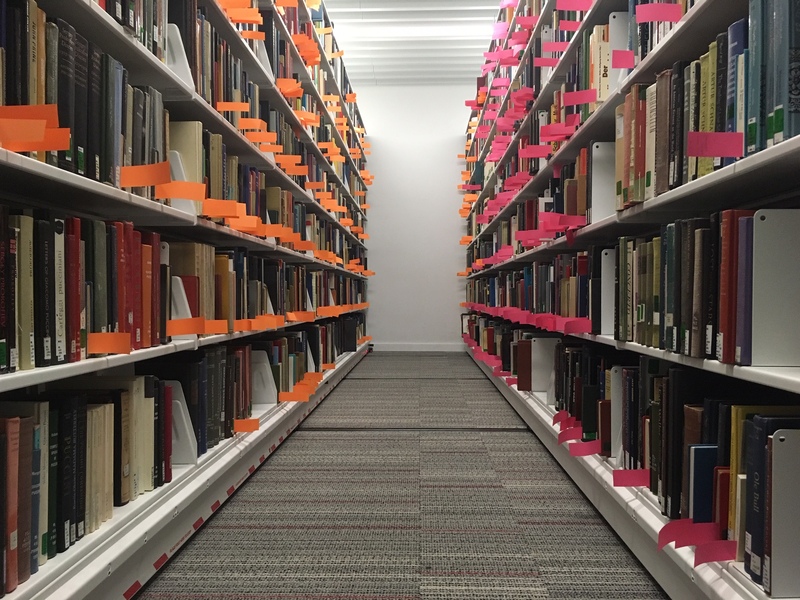 Books, Bound Journals, non-folio Scores, Miniature Scores, and Theses and Dissertations are in a 22 aisle compact shelving bay against the west wall. 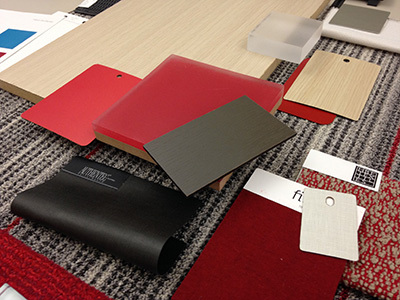 The shelves are electronically wired to move at the push of a button. 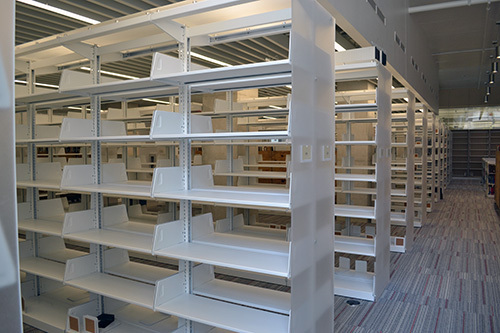 If you have questions about how to use the compact shelving, library staff will be happy to provide a quick demonstration. 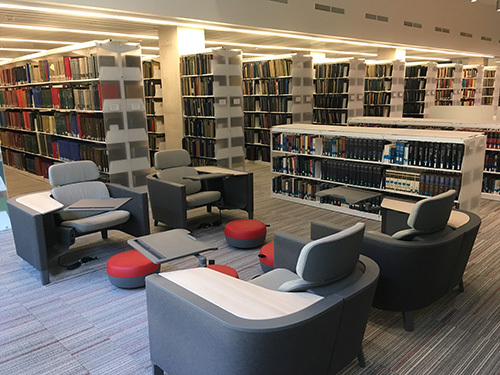 The Music Library is now home to a 16 seat classroom that will be used for academic classes, library workshops, and that will be made available for students to use for group study. 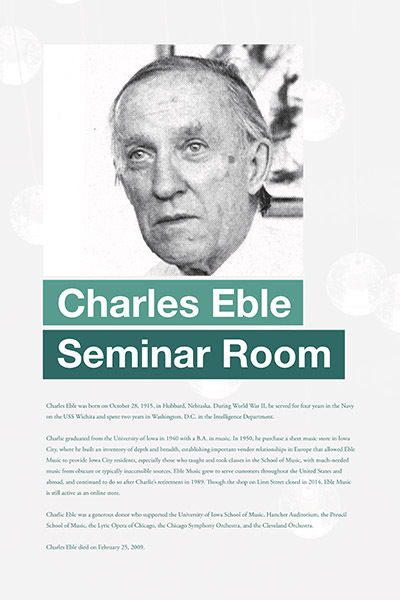 The room is named for Charles Eble, longtime owner and proprietor of sheet music shop Eble Music in Iowa City. 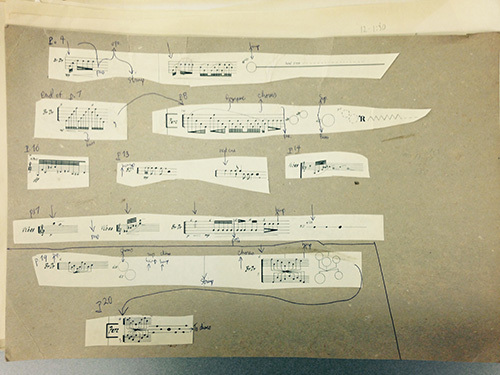 The Music Library is in the process of ingesting the School of Music Recording Archive into its collections. The long term goal is to digitize all reel-to-reel and DAT tapes contained in the Archive and to make them available to faculty, students and staff at the University. New Scanner – coming soon! One great perk of being in the Main Library was having access to their top-notch scanners. 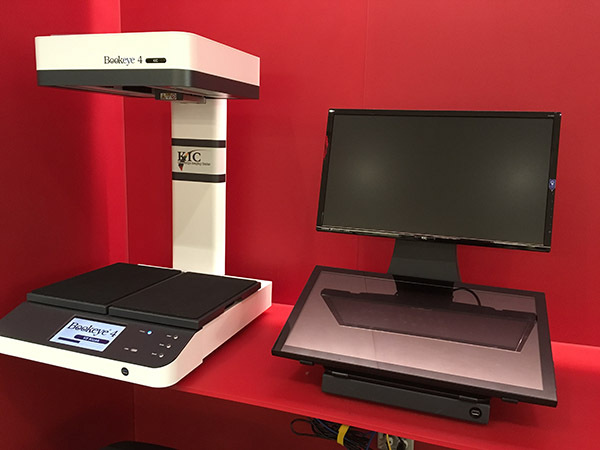 We do have a flatbed scanner right now, but will be adding an overhead scanner, like those at the Main Library, sometime during the Fall semester. 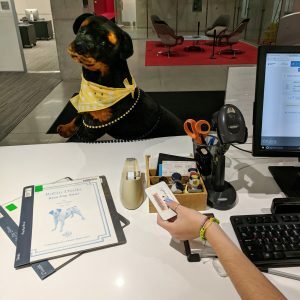 If you would like to check out ILL requests from the Music Library, you will need to change your desired Pick-Up Location in your ILL account. Log into ILL and you can change your account information in the left-hand menu. If you do change the location, expect each delivery to take more time; usually at least a day. 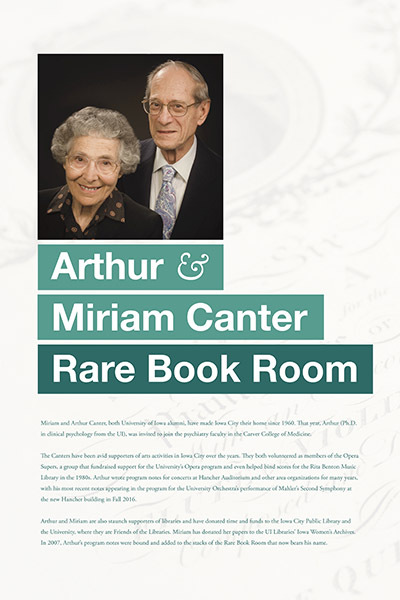 Our marvelous rare collection now resides in a space named for longtime Iowa arts patrons Arthur and Miriam Canter. If you would like to view an item from the rare collection, please ask for staff assistance at the Service Desk. Items may now be viewed on any day that the Music Library is open EXCEPT for Saturday. 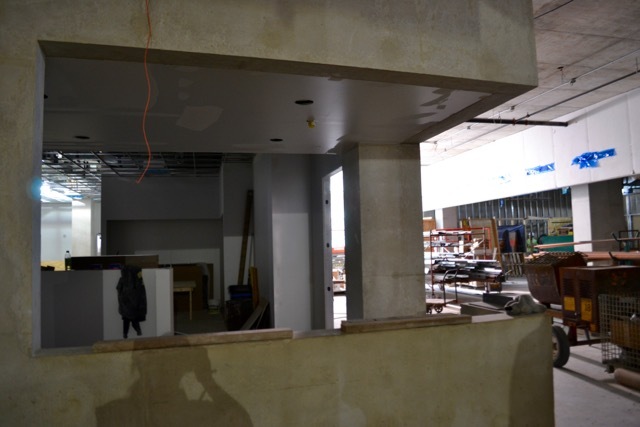 The Music Library has large windows facing south and west that let in stunning natural light and give the space an open and inviting atmosphere. 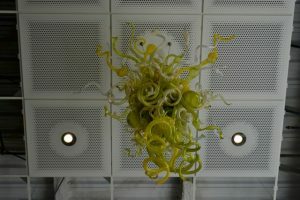 The south window stretches a full two stories, and hanging from the ceiling is a Chihuly glass sculpture, which was purchased with funds set aside by the State of Iowa for the installation of art in all state buildings. The Music Library’s hours are still Monday-Thursday, 8am-9pm; Friday, 8am-5pm; Saturday, 12pm-5pm; Sunday, 12pm-9pm. Our three full-time staff members – Amy McBeth, Megan Small, and librarian Katie Buehner – are all here to help you find with your research and answer your questions about how the Library works. If you have a question or concern, please ask! 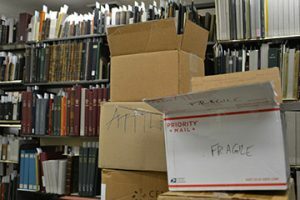 In eight years, the Music Library’s collection has seen significant growth so that it now contains over 205,000 items, over 90,000 of which are scores. 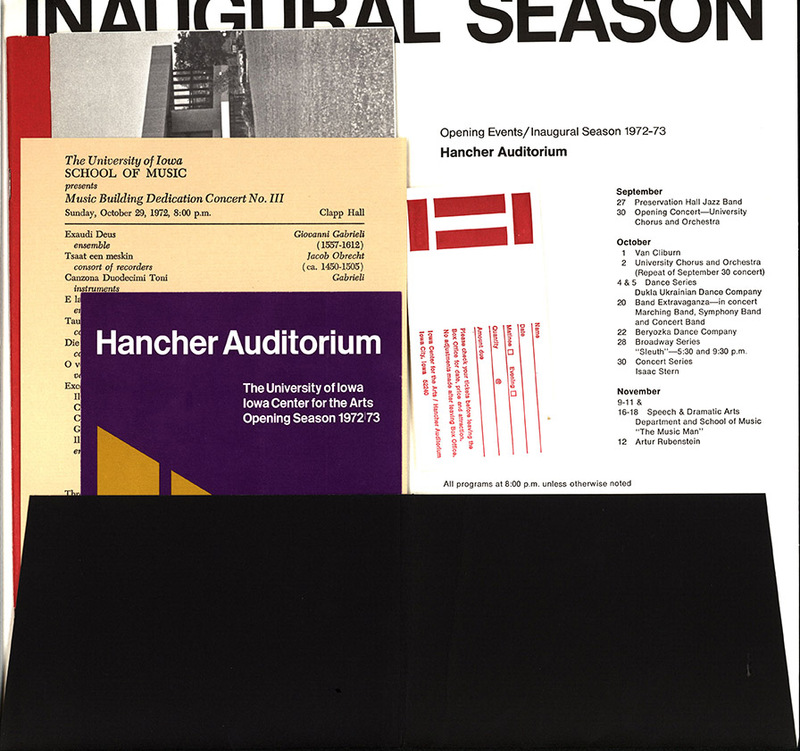 If there’s something you think the Library should add to its collection, please contact Music Librarian Katie Buehner <katie-buehner@uiowa.edu> with your recommendation. 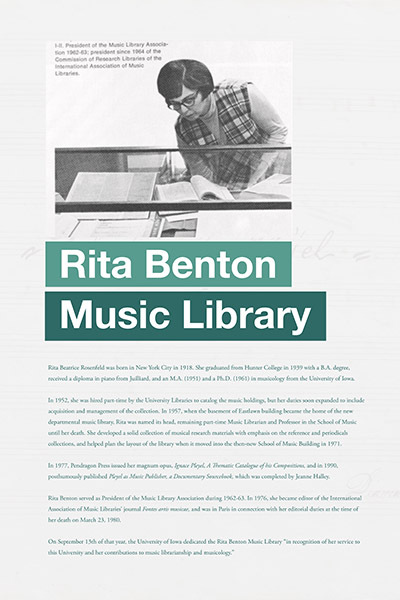 The Rita Benton Music Library retains its name, which was put in place in 1980 following the death of Iowa’s first music librarian, Dr. Rita Benton. Our two long window seat benches are also named in her honor, thanks to support from her family. Be sure to stop in, take a look, check something out, and say hello! 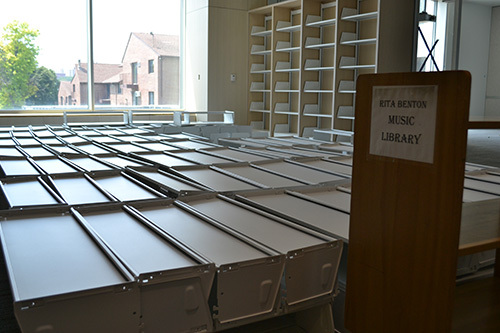 The Rita B enton Music Library will be moving from its temporary location on the second floor of the Main Library to its new home in the Voxman Music Building starting July 25th, 2016. This does mean that the collection will be unavailable or be subject to limited availability at various points during the move. Saturday, July 23: This is the last day the collection will be available prior to the move. 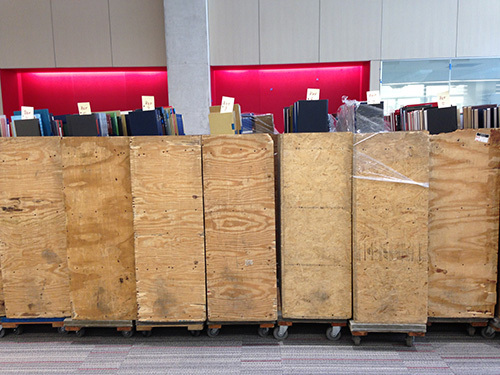 Monday, July 25: The Music Library move begins. Collections are unavailable to all patrons. 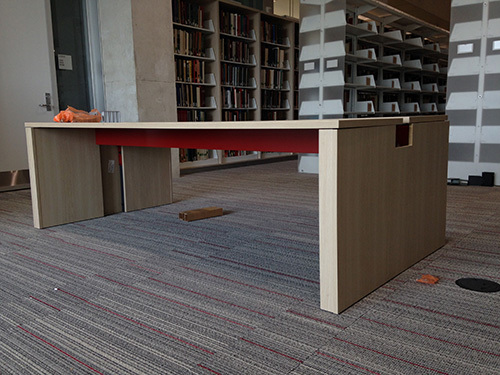 Friday, August 5: The Music Library move is complete. Monday August 8: Collections are ONLY accessible by faculty and staff with access to the Voxman Music Building. Student and public patrons will NOT have access to the collection at this time. Monday August 22: The Voxman Music Building opens. 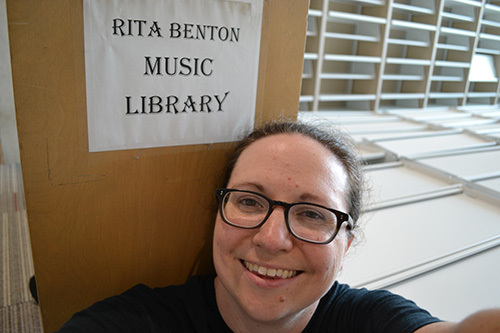 The Rita Benton Music Library collections are accessible by all patrons. If you need scores, recordings, and other music materials during the month of limited access, please use Interlibrary Loan or UBorrow to request items from other libraries. 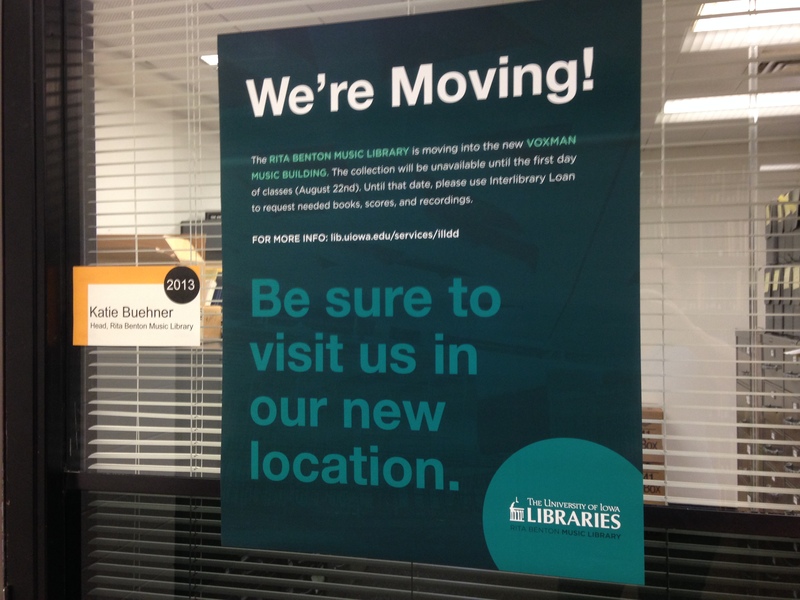 Make sure your delivery location remains the Main Library until the move is completed. The Music Library appreciates your patience during this time. 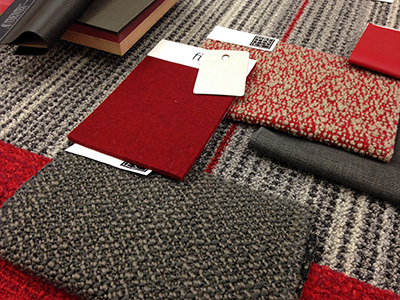 Please come visit us in our new space on the first floor of the Voxman Music Building at the start of the semester! 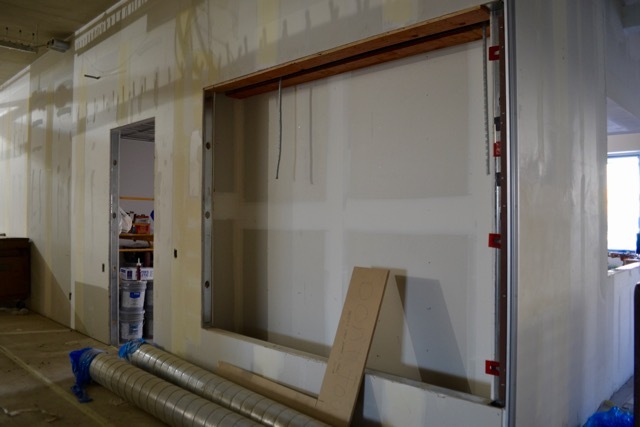 To receive additional updates on what’s happening at the Rita Benton Music Library, subscribe to this blog feed.